On May 8th, Brookings officially launched a new initiative on the Future of the Middle Class. Through this initiative, we will publish research, analysis, and insights that are motivated by a desire to improve the quality of life for those in America’s middle class and to improve upward mobility into its ranks. We have already wrestled with how we define this group, considered its changing racial composition, and called upon experts to outline major policies geared toward improving its fate. But why all of this attention? Here are seven of the reasons we are worried about the American middle class. The stagnant growth in median incomes is in stark contrast to the income trajectories of those at the very top of the income distribution. According to the Congressional Budget Office, the middle three household income quintiles experienced income growth rates of 28 percent from 1979 to 2014 in real terms. The top 20 percent – a group Richard Reeves refers to as “Dream Hoarders” – saw their incomes grow by 95 percent over the same period. Taxes and transfers reduce the level of inequality, but have done little to affect the trend. Further, the redistributive role of such policies is weaker in the U.S. than in other advanced economies, who have experienced smaller increases in income inequality than the U.S.
Trends in wealth inequality are even more dramatic than for income. One widely cited estimate from Emmanuel Saez and Gabrial Zucman suggests that the top 0.1 percent wealth share increased from 7 percent in 1978 to 22 percent in 2012. Not only has income growth slowed in recent decades, measures of overall welfare that include the value of rising life expectancy and the impact of growing consumption inequality have slowed as well – at least since 2007 – as shown by our colleagues Ben Bernanke and Peter Olson in the first chapter of Brookings Big Ideas for America, edited by Michael O’Hanlon. The retreat from work among less-educated prime-age adults, especially men, is well-documented. One reason for these declines in employment and labor force participation is that work is less rewarding. Wages for those at the bottom and middle of the skill and wage distribution have declined or stagnated. The “college wage premium” has flattened in recent years, but workers with a college degree can still expect to earn over 80 percent more than those with just a high school diploma. These trends are not only affecting those at the bottom – they are affecting workers in the middle as well. Our colleague Alan Berube shows that while workers of all skill levels were hard-hit by the Great Recession, those in the middle of the skill distribution (those with some college but no four-year degree) saw the steepest earnings declines. The story is the reverse for women, who are out-earning previous female cohorts. But they have yet to catch up with men. For both men and women, inequality in lifetime earnings is increasing. Whatever the rate of upward mobility, family background continues to play a strong role in determining who is upwardly mobile and who is not. Children born into poor families have a hard time making it into the middle class as adults, more so in the U.S. than in some other advanced countries such as Canada. Further, there appears to be a “glass floor” at the very top, protecting children from falling down the income ladder. These findings belie the very American idea that mobility is based only on hard work and merit. As class gaps in family formation, parenting styles, test scores, neighborhood quality, and college attendance and graduation continue to grow, the upward mobility of today’s children is increasingly at risk. Downward mobility is much less common for black girls, suggesting a complicated interaction between being both black and male. Place matters. Where you end up depends a great deal not just on your family background and your race but also on where you grew up. The chance that a child born in the bottom quintile will make it to the top quintile as an adult ranges from around 4 percent in Charlotte to 13 percent in San Jose. Alongside the diverging destinies of individuals is a great divergence in the prosperity of whole communities and regions of the country. 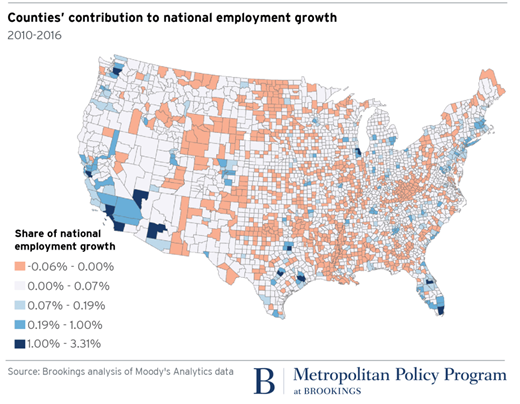 Employment and economic growth is far from consistent from one metropolitan or rural area to the next. Because various parts of the country are home to different industries and occupations, trade and technology have had differential impacts by region. Employment rates have, for example, fallen most dramatically in the nation’s rural areas, though there are still more non-working men in cities than in the heartland. As Muro and Whiton put it, “The nation’s bigger communities…are now growing notably faster and accounting for more and more of the nation’s growth than before, even as small metros wane and most of the rural hinterland slides into deep decline.” As such, the destinies and future of middle-class households varies sharply by geography, and national income trends are not reflective of the experience in many communities. Some “booming” cities have experienced gains in median income while others, particularly older manufacturing communities in the Midwest and Southeast, have experienced sharp declines. Similarly, according to Pew, more Americans think that today’s children will be financially worse off than their parents than those who believe they will be better off. This lack of optimism for the future is echoed in other signs of social distress. As our colleague Carol Graham documents in her book Happiness for All?, hope, aspirations, and optimism vary considerably across the population. In fact, blacks and Hispanics are generally more optimistic than whites, conditional on income. This points to the importance of relative status. Black and Hispanic Americans might be materially disadvantaged compared to whites, but they have experienced at least some upward movement over the past several decades, while many poor and middle-class whites might feel that their relative status in society has actually declined over the same time period. The evidence that social wellbeing is declining among many Americans, particularly whites, extends beyond the survey data. As Anne Case and Angus Deaton document, midlife mortality rates among non-Hispanic whites without college degrees is actually rising, while other educational and racial groups have experienced continued improvements in life expectancy and reduced midlife mortality. The “deaths of despair” that are the major contributors to this uptick in mortality among non-college whites include drug overdoses, suicides, and alcohol-related liver mortality. Though it is difficult to tease out cause and effect, the authors hypothesize that declining labor market opportunities and life prospects could be underlying this rise in mortality. So the declining economic prospects discussed above don’t just matter for intergenerational income mobility, they may also affect the emotional and social wellbeing of the middle class, and often in unpredictable ways. The sharp decline in marriage and rise in single parenthood is affecting everyone except those with college degrees. The majority of first births to women without such degrees now occur outside of marriage. Given the importance of a second earner to family incomes, the rise in single parenthood and the recent decline in female labor force participation pose serious threats to continued middle-class prosperity. These statistics are sobering, and they imply that there is a great deal of work to be done to improve the prospects of the American middle class. The challenge will be to improve those prospects in the face of changes in trade and technology that are destroying some jobs while creating others, yawning racial disparities, uneven economic growth from one place to another, and massive changes in gender roles and the family. Over the course of the Future of the Middle Class initiative, we invite you to engage with us as we delve more deeply into these topics in a search for the best ways to create a stronger middle class.